and then on neighboring farms, one being Peter Byskal's. Jack enlisted in the Army during the Second World War, and while in London, England, he married. Upon returning in 1944, he and his wife Katie made their home in Winnipeg where they presently reside. 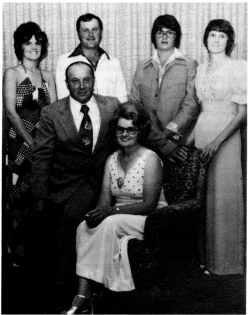 Their eight children are: Herbert, Eileen, David, Della, Jimmy, Jackie, Rosie and Kathy. Sam, born August 28, 1921 was named for his older brother. (refer to Chemerika, Sam and Mary). Roy, born February 28, 1923, on S.E. 1O-17-17W, attended Lund school. As a young lad he worked in the area, then to Ontario and came back west to Winnipeg. He married Thelma Bricoski at Steinbach, Manitoba, and are presently residing in Winnipeg. Roy and Thelma have a daughter, Gail. She and her husband Doug have a daughter Nadene and they reside in Winnipeg. Mary, born August 11, 1924, on S.W. 1O-17-17W, attended school at Lund. She helped on the farm, worked away from home in the winter months and then at Neepawa. Mary married Eli Sawchuk of Mountain Road and lived in Winnipeg before moving to St. Catherines, Ontario, where they now reside. Mary and Eli have a daughter, Sandra. She and her husband Glenn reside at St. Catherines, Ontario, and have two sons, Jeff and Gregory. Rose, born April 20, 1926, on S.W. 10-17-17W and attended Lund school. She moved to St. Catharines, Ontario, with family friends at fifteen years of age. Rose and her husband Charlie and daughter Brenda reside at St. Catharines. William, born December 14, 1930. (refer to Chemerika, William and Josephine). Walter, named for his older brother, was born February 2, 1935, on N.W. 11-17-17W, attended school at Lund and high school at Yorkton, Saskatchewan. He returned to the family farm where he remained until after his father's death. Walter, his young brother Nestor, moved to St. Catherines, Ontario. He and his wife Lousian and children, Dean, Brent and Lisa reside at St. Catherines. Nestor, born January 4, 1939 on N.W. 11-17-17W, also attended Lund school and later moved to St. Catherines, Ontario. Nestor and his wife Ella and three children, Denise, Wayne and Nestor, Jr. reside on a farm at Niagara On The Lake. Sam, son of Nick and Annie Chemerika was born August 28, 1921, on N.E. 36-16-17 and later moved to S.W. 11-17-17W with the family. He attended school at Lund and then at an early age helped on the family farm. Sam and Mary purchased N.E. 1O-17-17W and he spent the winter months cutting logs in the Riding Mountain National Park on a permit and then hauled them to John Zaruk's sawmill. In 1957, Sam, Mary and family moved to N.W. 11-17- 17W where they continued mixed farming. Sam drove a school bus for eleven years, retiring in February, 1982. They are members of the St. Mary's Ukrainian Catholic Church, The Erickson Legion and Auxilliary. Left to Right: Linda, Larry, Nickolas, Gloria. Seated: Sam and Mary Chemerika. Their four children are: Gloria, Larry, Linda and Nicholas. Gloria, born January 19, 1943, attended Lund school and received the remainder of her education by correspondence course. She was employed at the Erickson Medical Nursing Unit for four years previous to her marriage to Lawrence Labuke of Mountain Road. They reside in Winnipeg and have a family of eight; Darcy born September 14, 1964, Hailey born July 31, 1965, Tracy born December 3, 1966, Kevin born December 7, 1967, Shawn born January 31, 1969, Lisa born June 9, 1970, Lauren born January 22, 1973, and Jaimie born January 22, 1974.